Strip the blackcurrants from their stems. Place the currants in a non-corrodible saucepan with the sugar and crème de cassis (if using) and set over a low heat. Stir occasionally until the fruit has released some juice and the sugar has dissolved, then cover and simmer gently for about 8 minutes or until the fruit is quite soft. Meanwhile, soak the gelatine sheets in cold water for 5 minutes, then drain and squeeze out the excess water. Strain the hot blackcurrant juice on to the softened gelatine. 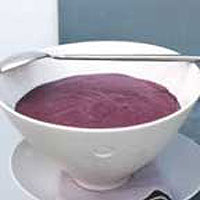 Stir quickly so the gelatine dissolves before pressing the remaining blackcurrant pulp through the sieve into the gelatine mixture. Leave until cool, then chill until it begins to set. This can take nearly 2 hours, but keep an eye on it, as it 'goes' suddenly. If you are in a rush, set the bowl over iced water and stir occassionally until it begins to set. At this point, immediately whip the cream until it forms soft peaks.